Comment: Book in almost Brand New condition. 100% Money Back Guarantee. Shipped to over one million happy customers. Since the first skyscraper was erected a century ago, tall buildings have intrigued people everywhere. Today they are so commonplace that it is hard to imagine the modern landscape without them. But skyscrapers are more than relics of the twentieth century; they have evolved, along with out technological, spatial and aesthetic needs, as the new urban landscape. Tall Buildings explores how the genre is being redefined for the twenty-first century, presenting a critical review of the current state of tall buildings, discussing structural inventions, programmatic innovations, and social and urbanistic implications. 26 skyscrapers and highrise structures designed in the last decade around the world exemplify these concepts. Each project, fully illustrated, is accompanied by an explanatory text. Included are Santiago Calatrava's Turning Torso in Malmo; Norman Foster and Ove Arup and Partners' Swiss Re Headquarters in London; Steven Holl and Robert Silman's 5th Avenue and 42nd Street Tower; Hans Hollein and Josef Janda's Monte Laa Towers; Arata Isozaki and Toshiko Kimura's JR Ueno Railway Station; Rem Koolhaas's CCTV Tower in Beijing; Teodoro Gonzalez de Leon, Francisco Serrano and Alejandro Fierro's Los Arcos Bosques 1 in Mexico; Renzo Piano and Charles Thornton's New York Times Headquarters; Richard Rogers and Ove Arup and partners' HHR Tower in Korea; SOM's Jin Mao Tower; Dr. Kenneth Yeang and T.R. Hamzah's Elephant and Castle Eco-Tower; plus various World Trade Center proposals. 25 selected, half realized and half not projects are very well depicted in this survey by excellent photos, renderings, plans, sections, site plans, models, sketches, details, hard line presentation drawings, etc. There is a balance between larger photos and more numerous tech. drawings. The book "Skyscrapers: The New Millennium" (ISBN: 3791323431) includes more projects, but fewer tech. drawings. 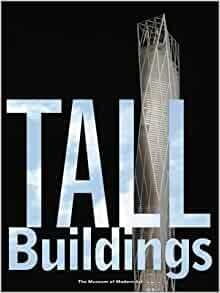 I love it as much as a required textbook about tall buildings could be loved. This book by MOMA is tremendously informative and visual. Great images from drawings, renderings, models and actual building photos really enhance the viewing of this book. There is also a corresponding exhibition at the MOMA QNS from July 2004-Sept 2004.